To give you a quick overview of all the parts that go together to make up the CoalaWeb Flair extension I have written this short summary. It will help give you good understanding of whats included in the system and also identify the different parts. 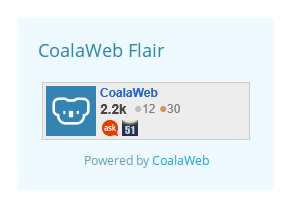 CoalaWeb Flair is a Joomla extension that lets you display your flair from several Stack Exchange sites individually or combined into one.